I've got POPCORN on the brain this week - for several different reasons. It all started with posting the Restyled Chalkboard Popcorn Bar last week. I received so many emails about how much you all loved the new edition to the original Rustic Popcorn Bar I styled - sweet, sweet emails from brides asking for tips on incorporating this idea into their wedding. 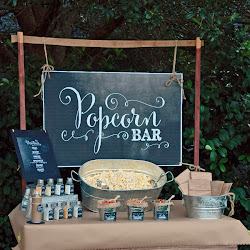 I even gave out 3 FREE SETS of the new Chalkboard Style Popcorn Bar printables here on the blog! All of this popcorn talk reminded me of a recipe I'd been wanting to make. I discovered the recipe in the September issue of Food Network Magazine. There was actually an entire section dedicated to "Fun Popcorn Treats" and the Golden Butter Popcorn Cupcakes recipe was what caught my eye and made me purchase the magazine. Not to mention the cute Kids Mini Mag inside. (there were some ideas in the mini mag I was going to use for Ella's 5th birthday party but I ended up not having time to execute the ideas - a recurring theme in my life). Needless to say I was very intrigued by the thought of a Popcorn Cupcake! So just last week, after posting the long-awaited Restyled Popcorn Bar - I knew it was time to finally try out the cupcake recipe. If you'd like to try out the recipe HERE'S THE LINK. 1. 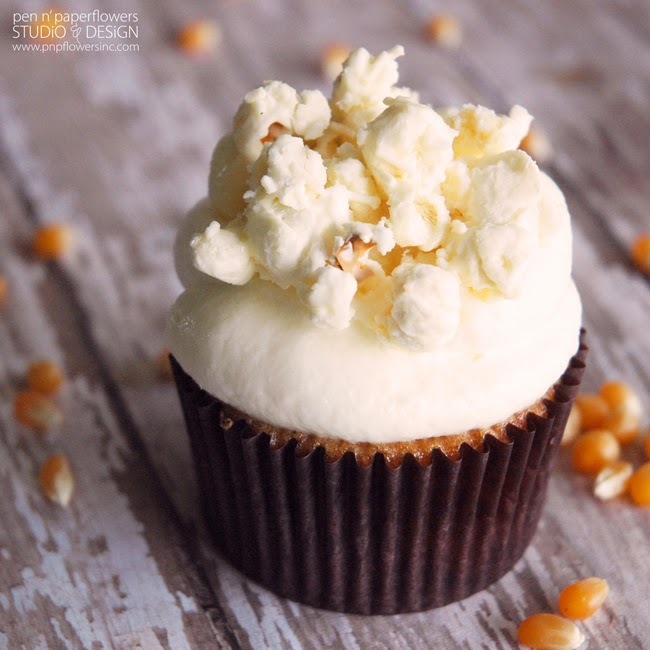 The popcorn topping I used on these Golden Butter Popcorn Cupcakes was made using Kernel Season's Popping Corn and it popped perfectly! 2. I did not crush up the white chocolate covered popcorn to incorporate into the whipped topping as recommended. I didn't think it would look as pretty when I piped it onto the cupcake and honestly, I didn't see any chunks in the photo of the cupcake shown in the magazine. The chocolate covered popcorn was a little on the chewy side for my tastes. I would've liked it to be more crunchy. 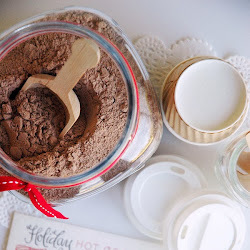 (Which is another reason I didn't add it to the whipped topping). 3. I think I would wait to add the popcorn topping just before serving. Like I mentioned above, the popcorn tasted a little chewy to me so I'm not sure if it was because of sitting in the whipped topping or if it's just from the white chocolate coating? 4. I personally would add a little fleur de sel to the popcorn topping - maybe just after you've added it to the cupcake just before serving? I prefer the salty & sweet combination. In fact, I'm thinking instead of adding a white chocolate coated popcorn topping, I'd probably prefer to add some kettle corn instead. (See this recipe) That would satisfy both my salty & sweet craving along with giving it more crunch. 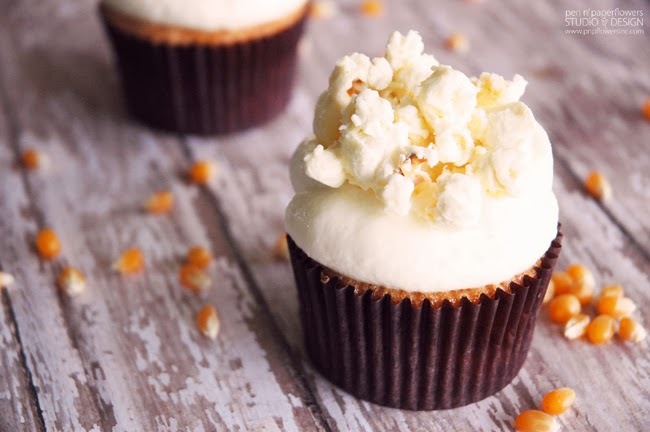 Now that you've got a fun Popcorn Cupcake recipe to try out…it's time for more POPCORN fun! 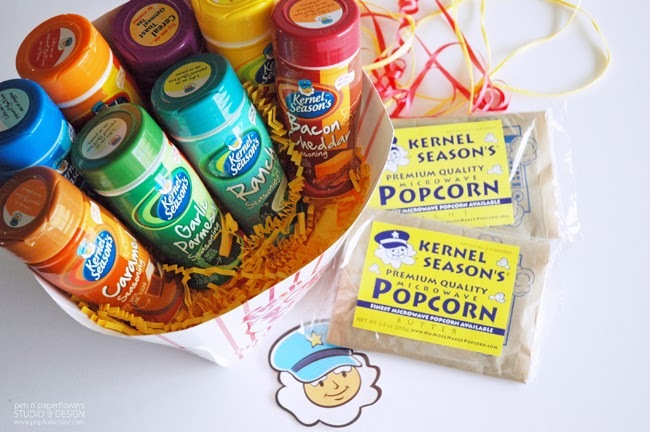 How about a FUN GIVEAWAY sponsored by the awesome people at Kernel Season's! 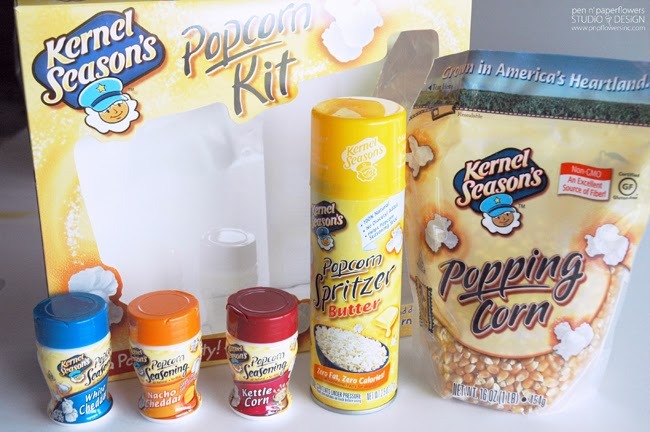 After posting the Restyled Chalkboard Popcorn Bar last week, Kernel Season's reached out to me to extend a FUN offer to my PNPF blog readers! 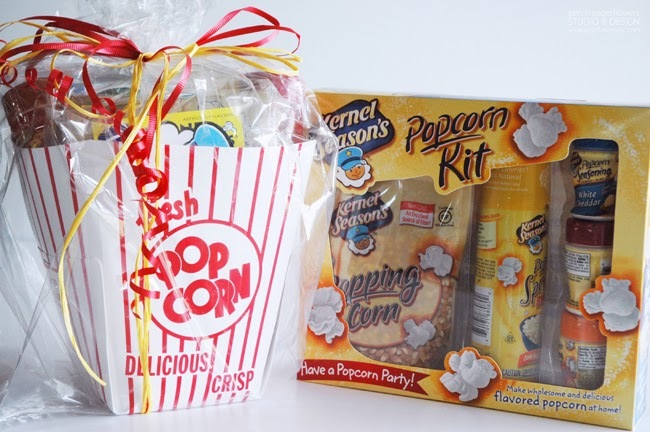 to receive one of these adorable Party Popcorn Gift Sets? 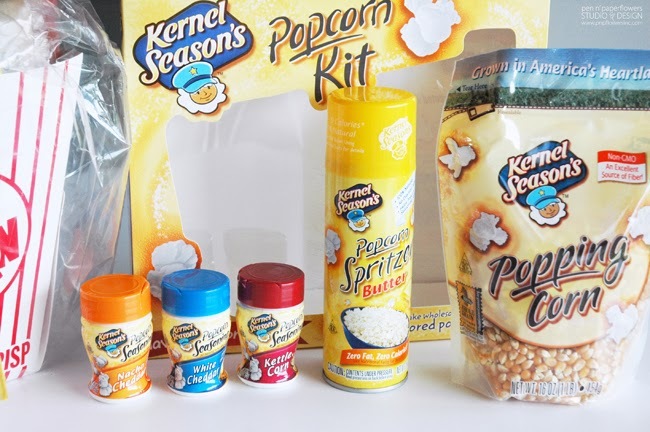 packaged in an ADORABLE OVERSIZED POPCORN BOX! 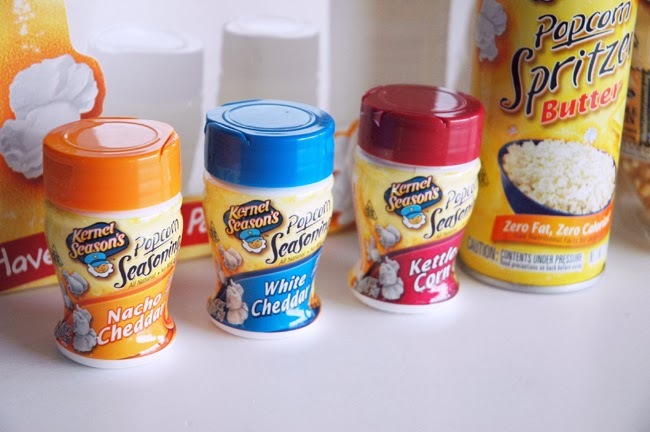 Those MINI seasoning bottles are so adorable!! LOVE them!! 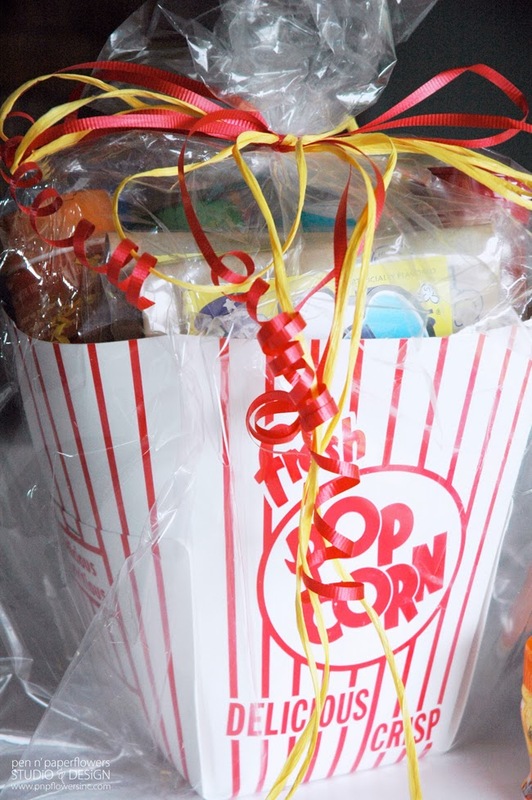 These party packs will be perfect for the popcorn we'll be popping on New Year's Eve! Each task has a certain number of points associated with it. 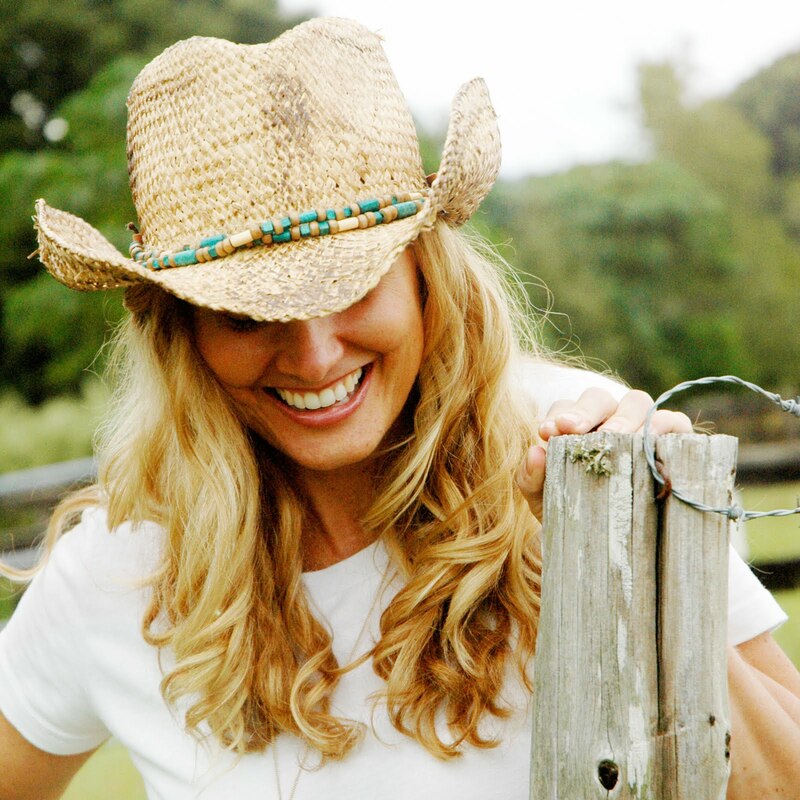 Each point represents your name "in the hat". Do one task or do ALL of them. You choose! 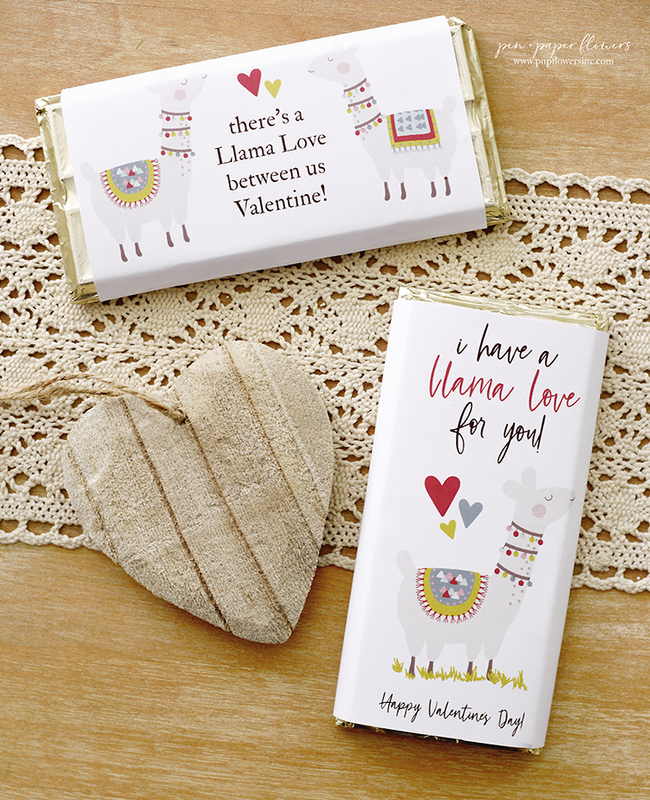 Buy any Gift Pack in December and they will send one to our troops overseas! I just LOVE that!!! I'll be purchasing a couple myself knowing my purchases will allow a couple of packs to be sent to those who sacrifice so much for us!! 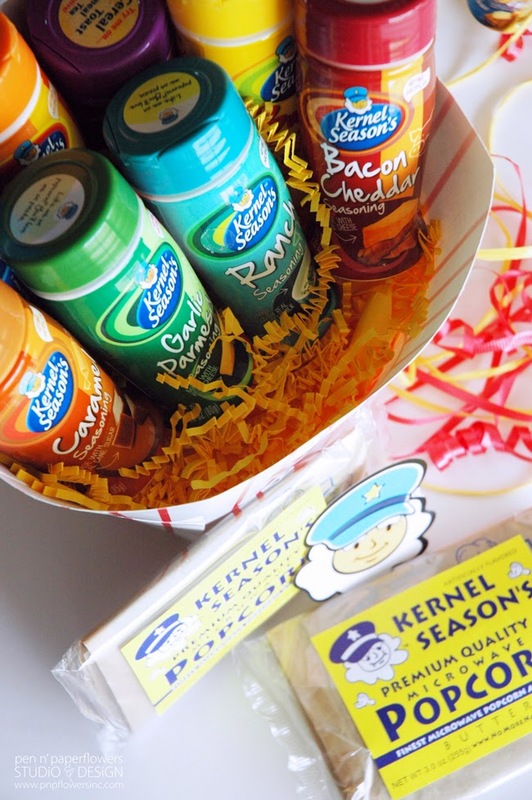 And thank you to Kernel Season's for offering up such a fun treat to PNPF blog readers and fans! 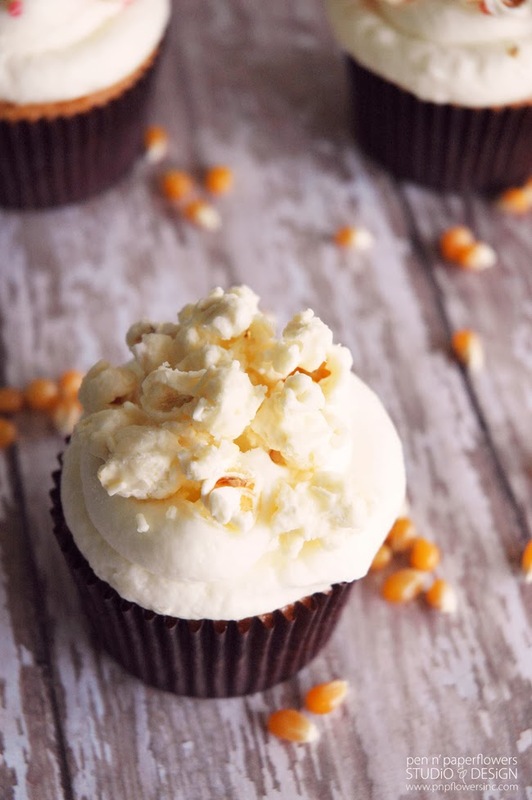 I was really hesitant about what the turnout would be when making the Golden Butter Popcorn Cupcakes. I brought 8 of them to a church activity and let some of our church friends taste-test them. They all gave them a thumbs up and agreed a little fleur de sel might be a good addition otherwise they had great flavor and the "cake" part was nice and moist. I like sweet/salty - like kettle corn! My favorite is white cheddar but I would love to try the ranch flavor! I'm a sucker for kettle corn! I love cheddar as well as bbq on mine (not together of course)! I do like butter and cheddar popcorn flavoring the best.